This article is about vehicle accidents. For the statistics procedure, see Jackknife (statistics). 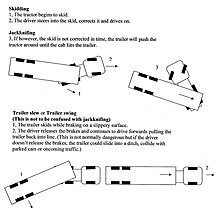 Jackknifing refers to the folding of an articulated vehicle so that it resembles the acute angle of a folding pocket knife. If a vehicle towing a trailer skids, the trailer can push the towing vehicle from behind until it spins the vehicle around and faces backwards. This may be caused by equipment failure, improper braking, or adverse road conditions such as an icy road surface. In extreme circumstances, a driver may attempt to jackknife the vehicle deliberately in order to halt it following brake failure. A jackknife event of a heavy vehicle can be fatal to the driver as the top of the cab can be crushed or sliced off as it swings round violently and tries to fold under the trailer. When a trailer skids to one side, this is known as a trailer swing or trailer slew. This could happen on a slippery road surface, often where there is a cant. This is not the same as "jackknifing" and is not as serious since the trailer moves back into line as the vehicle continues forwards. The driver must be aware, however, that the trailer could slide up against parked cars or a guard rail, or the wheels could slide into a ditch. This situation can occur especially when the trailer is empty or lightly loaded, and weather conditions cause violent gusts of crosswind. One system with limited success was a device that mechanically limited the angle which a trailer could swing. A much more successful system was to fit the tractor with anti-lock brakes. Fitted originally to airplanes in the 1950s, anti-lock brakes have significantly reduced the number of heavy vehicle accidents. Electronic brakeforce distribution varies the pressure to the rear brakes during heavy load or hard braking, enhancing driver control. Tractors used to be fitted with a lever in the cab to operate the trailer brakes. The vehicle could be slowed down or stopped using the trailer brakes only. Theoretically this was a sure way to prevent jackknifing, but this lever was often the cause of jackknifing in a roundabout way. Frequent use of the trailer brakes alone caused them to overheat and fade while the tractor brakes remained fresh. In the event of an emergency stop, the driver would go straight for the foot brake and the truck would surely jackknife because the tractor brakes would lock while the trailer brakes would be ineffective due to previous overheating. An alternative to having a trailer brake lever in the cab is to fit the trailer with an electromagnetic brake.